Matagal ko na gusto bumili nito at ilang beses nauunsami, mapag usapan nga muna kung ano ang pede masabi natin dito..
wouldn’t it be great to talk when you ride?! 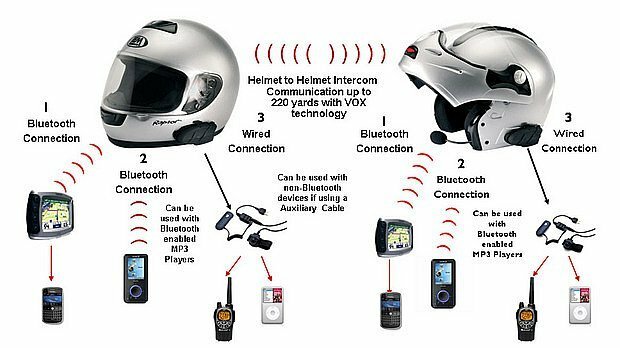 communication system, or you can chat with your pillion. perhaps listen to the audio navigation message from your Bluetooth enabled GPS. these things even if you are riding or snow skiing!!! the side of your helmet. This BIM can either be used for rider or for pillion. This BIM can connect with four Bluetooth devices: a Bluetooth enabled cell phone, two BIM (two riders or one rider and one pillion), an audio source which with a built in or a external audio Bluetooth transmitter. While out riding or snow skiing, the auto answer feature of the internal Bluetooth profile enables safe automatic Handsfree answering of the phone call automatically. It also offers a call rejecting function. the process of receiving call will be automatic, after ring on of the call about 5 seconds; it will receive the call automatically. It also can offer rejecting call function. The Maximum communication range over a high clear line of sight path can reach 500m/1640ft! (This maximum range is not guaranteed). depend on weather conditions, terrain, presence of obstacles, i.e. a large vehicle, buildings non line of sight etc. listen simultaneously, the BIM offers real-time talking like a normal telephone. It can connect with two other riders or connect with anther rider and his/her pillion. The working speed can be up to 120Km! 4) If your MP3, GPS did not have a built in audio Bluetooth transmitter, you only need to have a external audio Bluetooth transmitter (sometimes called an AV Dongle, you can find it easily in the market) to pair with them, then you also can enjoy this added functionality. We have provided you with the ability to charge the system via the USB port of your computer or if you are away on a trip, you can use the supplied Multi-voltage USB power adapter. Note: if you do not use the headset for a month or more, to protect the Poly-Li battery, please charge the headset at least every month. (The fault damaged by wrong charging will be not guaranteed). seconds without any tool and screw. Attaching the two speakers and the microphone . The success of the system depends on the careful positioning of the ear speakers directly over top of the ear canals. This will give the best signal to noise of the received audio. 1) To find the position of your ear canals, put your helmet on firmly but don’t do it up. Slide your thumb of one hand up between the inside of the helmet and your ear, with the fingers of that hand on the exterior of the helmet. Feel the ear canal in your ear with your thumb and then grip the helmet firmly between thumb and fingers of that hand, carefully take the helmet off BUT don’t move your thumb from its position inside the helmet. Look at where your thumb it! This place marks the centre of the ear speaker! Mount the Velcro pad to which the speaker will attach there, inside the helmet; check the other side for optimum ear speaker position. 2) Remove the protective backing of the Velcro and mount the Velcro pads in the correct positions, attach the two speakers on the Velcro inside your helmet, the speaker with short wire cord for left ear, the speaker with long wire cord for right ear. 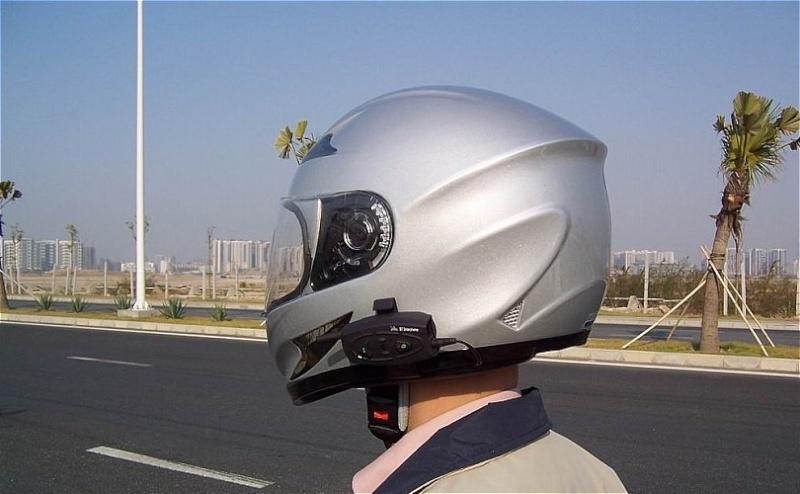 3) Plug in the positioned headset to the communications module and attach it to the side of the helmet. The operation is friendly and very easy. Before using the BIM, please familiarize yourself with Bluetooth function of your cell phone. Read the instruction manual that came with the phone so you can enable its Bluetooth function. this Phone and the BIM come into contact again. 1) Enable the Bluetooth function on your cell phone. 2) You must place the BIM in “Pairing mode”, this is done by way of a holding down the Power/Interphone key on the headset, until the red & blue LED flash alternately. the Power/Interphone keythen the blue led will extinguish. Connect the cell phone for some reason (e.g. In some regions of high RF strength), may the BIM will lose connection with the cell phone, a short press on the Phone/Play key, they will connect each other. When income a cell phone calls, you will hear the ring on the cell phone and about 3-5 seconds later, the BIM will receive the call automatically. When you finish talking on the cell phone, a short press the Phone/Play Key, will terminate the call. Pairing is a one time process that is required for mutual recognition between a headset and other Bluetooth devices. once the two headsets are paired, they will retain paired whenever they are within range. Please note that you can speak via intercom to one buddy headset at a time. and the blue LED then will flash briefly every 2-5 seconds, thus they have finished the pairing. You can set up your BIM as a master device and you can pair with two BIM of other riders, then you can talk with two riders at different time. with another rider (BIM c). When finish the pairing procedure, you can turn on the BIM b. Initiate an intercom call (a short press the Power/Interphone key on your BIM), and you can talk with BIM c. However, a long press the Power/Interphone Key, you will hear a beep”du-du”, promptly release your hand; it will change the communication to talk with BIM b.
can not initiate an intercom talking, when one of the master unit change communication to talk with the slave unit, the slave unit will become master unit. Read the user manual of your cell phone carefully, if your cell phone is A2DP enabled, the BIM can receive the stereo music from the cell phone. Please note that only A2DP (stereo Bluetooth) enabled cell phone can offer Bluetooth music transmitting service. You can use the Phone/Play key to pause/play the music from A2DP Bluetooth devices. Almost all of Nokia mono Bluetooth enabled cell phone can offer Bluetooth music transmitting service, but some model of other brand cell phone can not offer this service. We do not promise that the BIM will support music function for all mono Bluetooth enabled cell phones. Step: confirm that your BIM has paired with your cell phone; play the music on the cell phone, and then you can enjoy the music on your BIM. Note: for mono Bluetooth cell phone, you can not use the Phone/Play key to operate the music; you only can operate the music on the phone. the plug of the BIM cord (speakers & microphone cord) is 3.5mm,it will can be inserted into a major of MP3,insert it into your MP3 and play the MP3,you will can listen to the music from your MP3. the way is same to listening to music from a MP3. If you have a external audio Bluetooth transmitter (it’s easy to find this product in the market), insert the plug of the transmitter into the jack of the MP3. Pair the transmitter with the BIM according to the instruction manual of the transmitter. Play the MP3; you can listen to the music on your BIM. The way is similar with 7) above. Please familiarize yourself with Bluetooth function of your Bluetooth enabled MP3 (this MP3 must has Bluetooth transmitting function). Read the instruction manual that came with the MP3 so you can enable its Bluetooth function. Pair the MP3 with the BIM according to the instruction manual of the MP3. Play the MP3; you can listen to the music on your BIM. 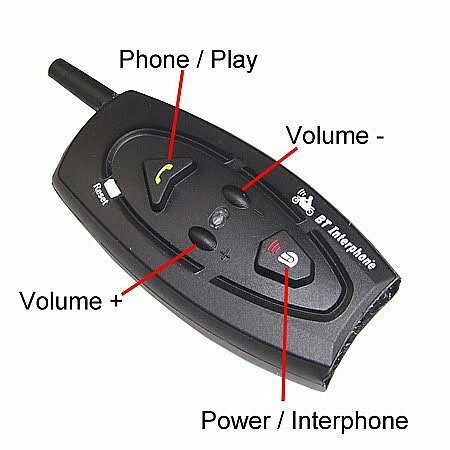 Switch between different operations While talking by intercom or listening to music, if it incomes a cell phone call, the voice will be switched to “cell phone talking” state automatically. After the call has been hung up, the system will auto return to intercom talking or music playing state. While listening to music, short press the Power/Interphone key, it will launch an intercom talking after hanging up the call, the system will return to the music automatically. talking” has been hanged up. 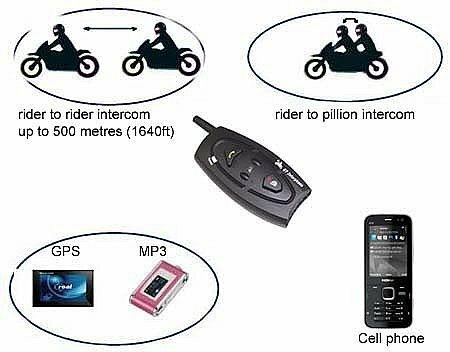 Re: bluetooth motorcycle communication gadget. papa ying plan ko mag parating nito pag dating ni misis on July 20,,, brooommm san natin sisimulang gamitin ito... hehe sana matuloy na para ma testing, plan ko i bisniz so baka i post ko ito sa mcp, may nabalitaan kana ba na meron nito dito sa pinas? auJHOtech wrote: ot- kamusta rehistro mo? wait namin ang item na iyan sarap gamitin sa long and group ride iyan ..
oo naman.. kahit di ako makasama sa ride basta may ride ang QC-Bulacan chapter pwede ko ipahiram ito free, isine set up to sa helmet so double adhesive tape lang ang katapat. panay na nga ang paglalambing ko ke misis para bilihan nya ko, nasa hongkong kasi sya at nasa mainland china ang supplier, US dollar pa ang bayaran kaya may transaction pa bago makuha. july 20 uuwi si misis, lets hope for this para matesting natin..
my beloved wife paid in bank our order of this unit,,, hintay nalang mai deliver at hopefully dala na nya when she get home in July20. yahooo...!! mahahalikan ko asawa ko ng milya milya at kelangan super romantic ang 1st night namin pag dating hahaha!! ano nga pala nag yari sa item at doon sa pera ibinayad nyo ..pwede ba isoli ito ? since it didnt reach its feature as advertise , does the seller will return your cash ,as well as you will send back the unit to him ? No wala naman ako balak isoli, at kung sasadyain ko naman e magiging long process pa, gagawa lang ako ng dagdag sakit ulo kasi sa totoo hirap kausap ang instik. maganda pa rin naman gamitin in a 100mtrs distance sa kapwa rider, that's about 1 stretch of a basketball court, lalo kung very long ride eh iba pa rin yung me kakwentuhan ka parang mas exciting ang byahe. 1 option na nakikita ko kung me unli call kayong 2 rider at magtawagan tapos gagamitin mo lang phone call receiver ang bluetooth com set eh baka mas malayong distance ang pwede nyo marating at nagkakausap pa rin kayo. im still checking ang battery life ilang oras ang working time bago icharge. » What gadget do you take on holiday?